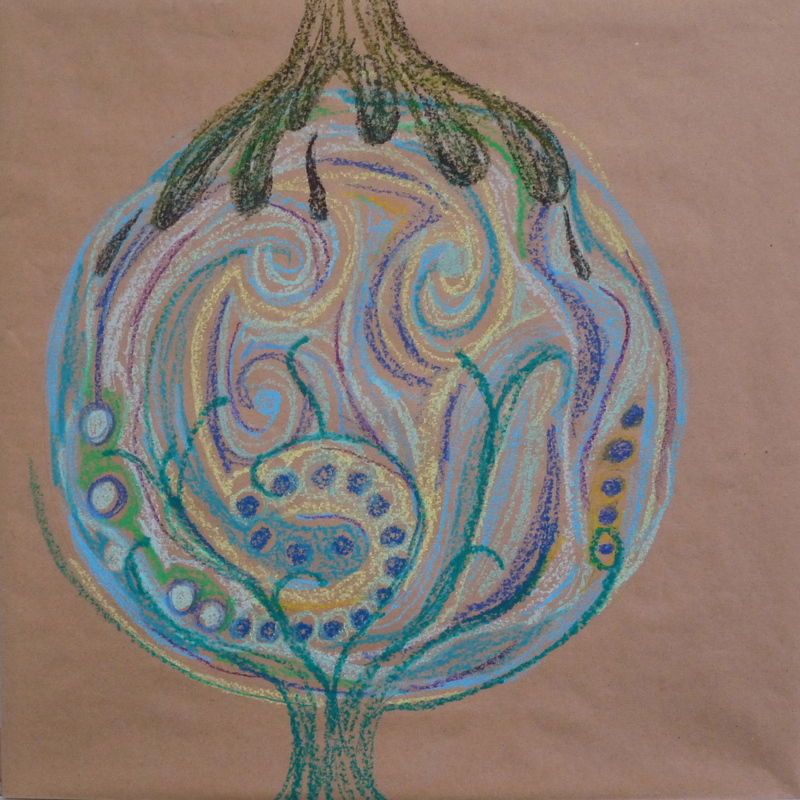 I recently taught an Introduction to Art Therapy undergraduate class at Herron School of Art and Design here in Indianapolis. Toward the end our summer session course, I drove downtown with a very loose plan in mind for what we were to do that day. I knew that I wanted the students (adept at visual art) to explore how movement, voice, poetry and story were also healing arts. I knew that, months ago, when creating the class syllabus, I had listed “mandala” as the in-class art activity. And I remembered other expressive therapy mandala-making that I had facilitated over the years. Each of these experiences had been very different, with a large element of spontaneity and unpredictability. And so, this day, I intentionally left my plans open, waiting to see what would unfold. As I parked my car and walked to the art school, I was pleased that the morning was less humid than the days before, the kind of morning that made me want to stay outside. And so I realized the day need us to be outside as part of the class. And then a one of the poems I have recently learned by heart came to mind as a perfect way to start the day. 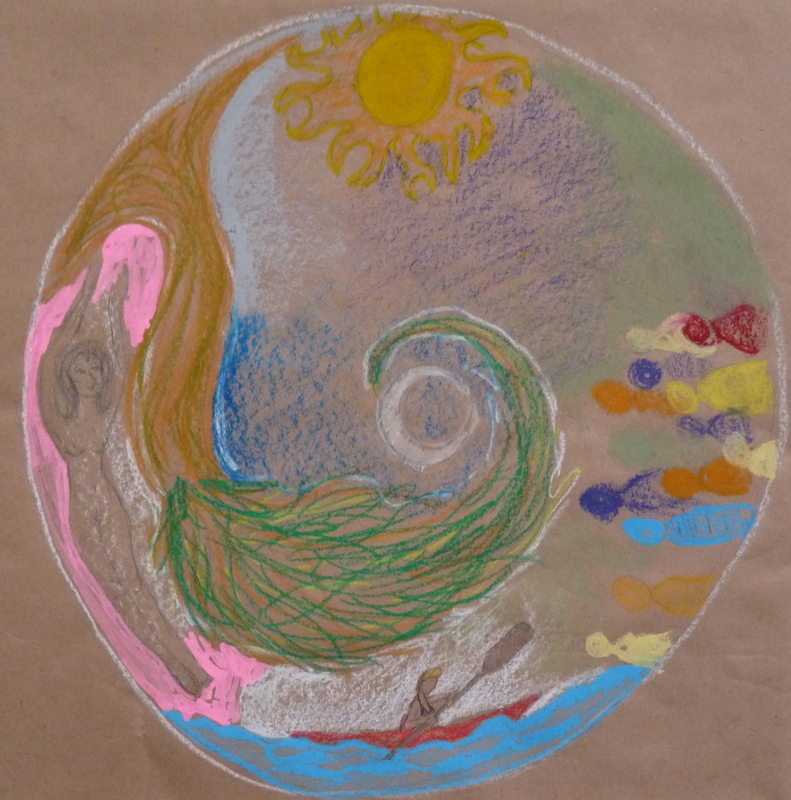 After several quiet minutes, I invited the students to stay outside and to create mandalas, a circular drawing through which one’s current relationship to wholeness can be expressed. An hour later, we gathered inside the classroom and I asked the students to not talk about the experience, but instead, to arrange the mandalas into a circle, deciding as a group how to connect our individual creations to each other. We then stood in a circle facing our mandalas. I asked the students to imagine a sound that belonged to their mandala, and then share that sound aloud. I went first because most people, including me, feel awkward and self-conscious making wordless sound in front of others. I tried to be relaxed, playful, silly, while doing my mandala’s “aaaahhh! !” sound. I asked the group to mirror back my sound, and then we went around the circle, each student choosing a sound and hearing it mirrored back by the group. We then added a movement to the sound and mirrored this back for each other. We laughed as we went around the circle. My “aaaaaaaahhh! !” became longer and deeper as I lifted my arms in the air and lowered them as in a head-to-toe release. By starting with sound and movement and limiting our use of language, my intention was to help us shift out of our habitual linear and rational way of thinking to our more ancient and mythic mind. And so, after naming the mandalas I asked the group to consider what story the mandala circle we surrounded might be telling us. Someone said that they saw “the elements” expressed within the mandalas. Another student said she saw “the stages of life,” and she pointed to each of the mandalas identifying the stage she saw in it: birth, childhood, adolescence, adulthood, death. I sensed this idea resonating with the group and so invited the students to talk about each other’s mandalas, not explaining our own mandala’s original intention, but describing what we saw in them now in light of the “Stages of Life” story that was unfolding. We were surprised how much we saw in each other’s mandalas that was not placed their consciously, but came from some other source. 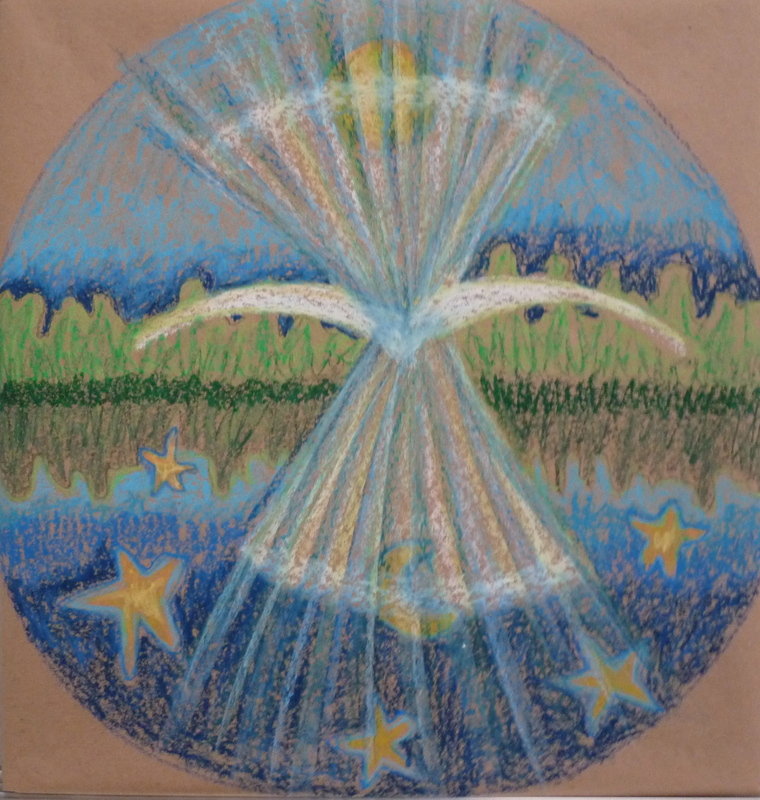 For instance, in our collective story, my mandala had been identified as the stage of life “death.” While making it, I had begun by making arcing white shapes, and then felt the urge to meet these at a central point. Then I became immersed in creating a mirror world behind the white arcs, one day, one night. I felt I was responding the the feeling of newness in the fresh inviting morning. Yet, even while creating it, a fleeting awareness passed through me of a former client’s art made in response to a near-death experience. As we talked, I felt goosebumps for how this mandala that evoked for me letting go, release, and the name “Now” was somehow unconsciously an expression of the letting go and release of death. 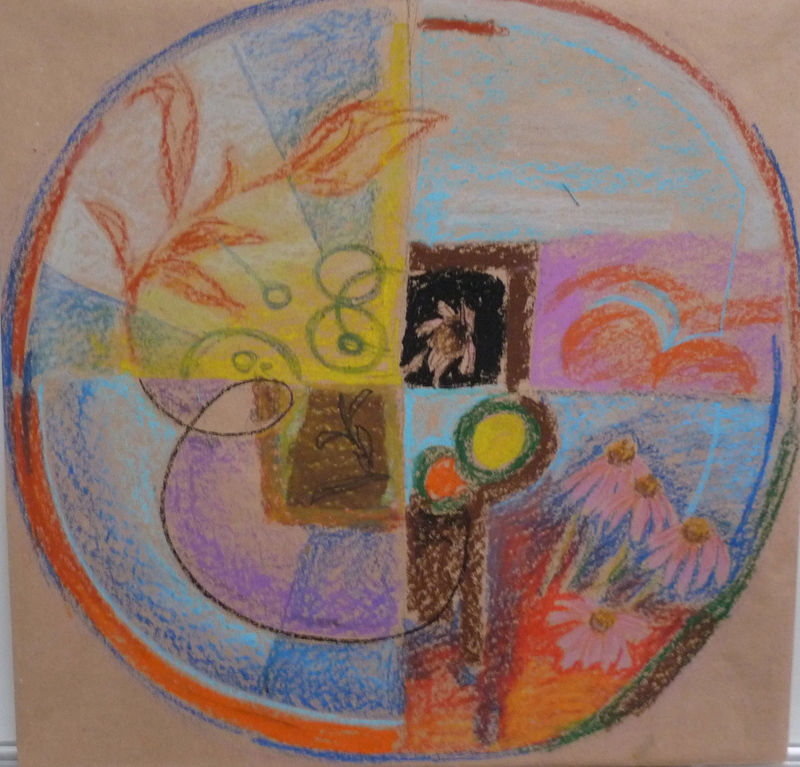 Responding to this question, the group looked again at the five mandalas as representations of the stages of growth that we will go through as a changing culture. We saw in “Childhood” a reconnection to nature, to knowing ourselves as part of the natural world. We saw in “Adolescence” a journey toward community that honors the feminine. We saw in “Adulthood” a maturing wisdom and treelike rooted presence. We saw in “Death” the passing away of the old era and the promise of a new day, a new mindful way of living. To bring our story to a close, we went around the circle again saying our mandala’s name, with expressive sound and movement, this time being conscious of the deeper collective story that the mandalas had given us. The self-consciousness we felt at the beginning of the our sharing was no longer with us. Now we spoke and moved with a calm reverence, a quiet awe. I had had no expectations that what we did that day would unfold in the way it did, that I had planned only to set the stage, invite the creation of mandalas, and see what followed. I told them that I was surprised by the depth we reached. And yet not at all surprised. 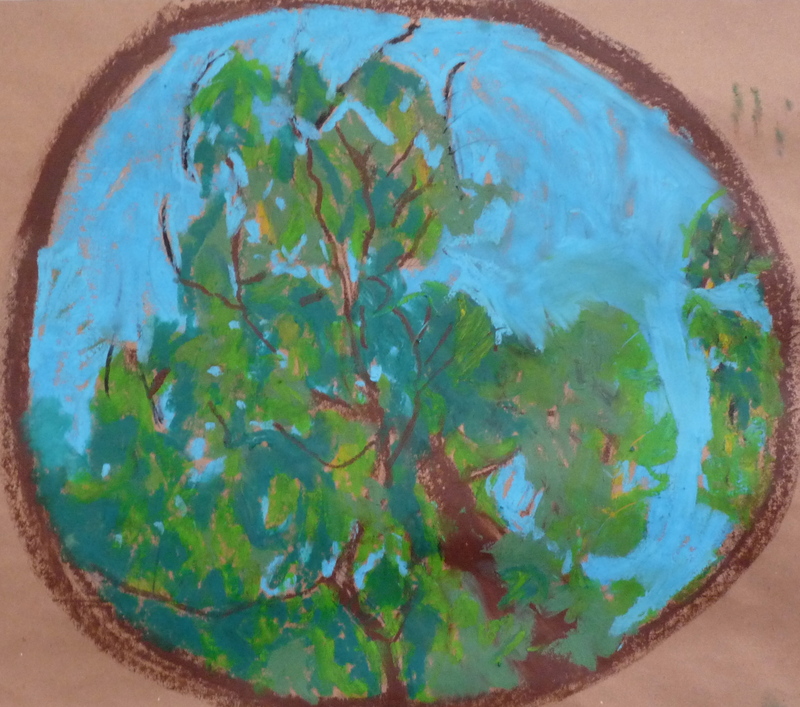 Given that we made mandalas in nature and community. In such a process, what else would we connect to if not the Circle of Life? It wasn’t really that we stumbled upon something new and unexpected. Instead, we changed ourselves. We stepped out of the limited awareness that is our cultural habit, and entered the wholeness that is there always. This entry was posted on July 7, 2010 at 12:10 pm and is filed under Uncategorized. You can subscribe via RSS 2.0 feed to this post's comments. You can comment below, or link to this permanent URL from your own site.